An expressive orange-ware clay vessel in the Toltec style, from the American Museum of Natural History collection. The Toltec culture (/ˈtɒltɛk/) is an archaeological Mesoamerican culture that dominated a state centered in Tula, Hidalgo, Mexico in the early post-classic period of Mesoamerican chronology (ca. 900–1168 CE). 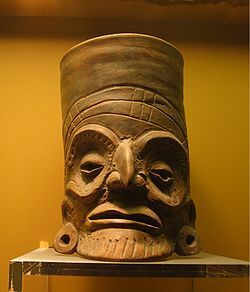 The later Aztec culture saw the Toltecs as their intellectual and cultural predecessors and described Toltec culture emanating from Tōllān [ˈtoːlːaːn] (Nahuatl for Tula) as the epitome of civilization; in the Nahuatl language the word Tōltēcatl [toːlˈteːkat͡ɬ] (singular) or Tōltēcah [toːlˈteːkaʔ] (plural) came to take on the meaning "artisan". The Aztec oral and pictographic tradition also described the history of the Toltec Empire, giving lists of rulers and their exploits. Modern scholars debate whether the Aztec narratives of Toltec history should be given credence as descriptions of actual historical events. While all scholars acknowledge that there is a large mythological part of the narrative, some maintain that by using a critical comparative method some level of historicity can be salvaged from the sources. Others maintain that continued analysis of the narratives as sources of actual history is futile and hinders access to actual knowledge of the culture of Tula de Allende. Other controversies relating to the Toltecs include the question of how best to understand the reasons behind the perceived similarities in architecture and iconography between the archaeological site of Tula and the Maya site of Chichén Itzá. No consensus has yet emerged about the degree or direction of influence between these two sites. Another source of controversy is that New Age authors such as Carlos Castaneda and Don Miguel Ruiz falsely claim they represent "Toltec" teachings. For these New Age impersonations see Toltec (Castaneda). Some archaeologists, such as Richard Diehl, argue for the existence of a Toltec archaeological horizon characterized by certain stylistic traits associated with Tula, Hidalgo and extending to other cultures and polities in Mesoamerica. Traits associated with this horizon are: The Mixteca-Puebla style of iconography, Tohil plumbate ceramic ware and Silho or X-Fine Orange Ware ceramics. The presence of stylistic traits associated with Tula in Chichén Itzá is also taken as evidence for a Toltec horizon. Especially the nature of interaction between Tula and Chichén Itzá has been controversial with scholars arguing for either military conquest of Chichén Itzá by Toltecs, Chichén Itzá establishing Tula as a colony or only loose connections between the two. The existence of any meaning of the Mixteca-Puebla art style has also been questioned. A contrary viewpoint is argued in a 2003 study by Michael E. Smith and Lisa Montiel who compare the archaeological record related to Tula Hidalgo to those of the polities centered in Teotihuacan and Tenochtitlan. They conclude that relative to the influence exerted in Mesoamerica by Teotihuacan and Tenochtitlan, Tula's influence on other cultures was negligible and was probably not deserving of being defined as an empire, but more of a kingdom. While Tula does have the urban complexity expected of an imperial capital, its influence and dominance was not very far reaching. Evidence for Tula's participation in extensive trade networks has been uncovered; for example, the remains of a large obsidian workshop. Stucco relief at Tula, Hidalgo depicting Coyotes, Jaguars and Eagles feasting on human hearts. The debate about the nature of the Toltec culture goes back to the late 19th century. Mesoamericanist scholars such as Veitia, Manuel Orozco y Berra, Charles Etienne Brasseur de Bourbourg, and Francisco Clavigero all read the Aztec chronicles and believed them to be realistic historic descriptions of a pan-Mesoamerican empire based at Tula, Hidalgo. This historicist view was first challenged by Daniel Garrison Brinton who argued that the "Toltecs" as described in the Aztec sources were merely one of several Nahuatl-speaking city-states in the Postclassic period, and not a particularly influential one at that. He attributed the Aztec view of the Toltecs to the "tendency of the human mind to glorify the good old days", and the confounding of the place of Tollan with the myth of the struggle between Quetzalcoatl and Tezcatlipoca. Désiré Charnay, the first archaeologist to work at Tula, Hidalgo, defended the historicist views based on his impression of the Toltec capital, and was the first to note similarities in architectural styles between Tula and Chichén Itza. This led him to posit the theory that Chichén Itzá had been violently taken over by a Toltec military force under the leadership of Kukulcan. Following Charnay the term Toltec has since been associated with the influx of certain Central Mexican cultural traits into the Maya sphere of dominance that took place in the late Classic and early Postclassic periods; the Postclassic Mayan civilizations of Chichén Itzá, Mayapán and the Guatemalan highlands have been referred to as "Toltecized" or "Mexicanized" Mayas. The historicist school of thought persisted well in to the 20th century, represented in the works of scholars such as David Carrasco, Miguel León Portilla, Nigel Davies and H. B. Nicholson, which all held the Toltecs to have been an actual ethnic group. This school of thought connected the "Toltecs" to the archaeological site of Tula, which was taken to be the Tollan of Aztec myth. This tradition assumes that much of central Mexico was dominated by a Toltec Empire between the 10th and 12th century AD. The Aztecs referred to several Mexican city states as Tollan, "Place of Reeds", such as "Tollan Cholollan". Archaeologist Laurette Sejourné, followed by the historian Enrique Florescano, have argued that the "original" Tollan was probably Teotihuacán. Florescano adds that the Mayan sources refer to Chichén Itzá when talking about the mythical place Zuyua (Tollan). Many historicists such as H. B. Nicholson (2001 (1957)) and Nigel Davies (1977) were fully aware that the Aztec chronicles were a mixture of mythical and historical accounts; this led them to try to separate the two by applying a comparative approach to the varying Aztec narratives. For example, they seek to discern between the deity Quetzalcoatl and a Toltec ruler often referred to as Topiltzin Ce Acatl Quetzalcoatl. View of the columns of the burned palace at Tula Hidalgo. The second ballcourt is in the background. Toltec warriors represented by the famous Atlantean figures in Tula. In recent decades the historicist position has fallen out of favor for a more critical and interpretive approach to the historicity of the Aztec mythical accounts based on the original approach of Brinton. This approach applies a different understanding of the word Toltec to the interpretation of the Aztec sources, interpreting it as largely a mythical and philosophical construct by either the Aztecs or Mesoamericans generally that served to symbolize the might and sophistication of several civilizations during the Mesoamerican Postclassic period. Scholars such as Michel Graulich (2002) and Susan D. Gillespie (1989) maintained that the difficulties in salvaging historic data from the Aztec accounts of Toltec history are too great to overcome. For example, there are two supposed Toltec rulers identified with Quetzalcoatl: the first ruler and founder of the Toltec dynasty and the last ruler, who saw the end of the Toltec glory and was forced into humiliation and exile. The first is described as a valiant triumphant warrior, but the last as a feeble and self-doubting old man. This caused Graulich and Gillespie to suggest that the general Aztec cyclical view of time, where events repeated themselves at the end and beginning of cycles or eras was being inscribed into the historical record by the Aztecs, making it futile to attempt to distinguish between a historical Topiltzin Ce Acatl and a Quetzalcoatl deity. Graulich argued that the Toltec era is best considered the fourth of the five Aztec mythical "Suns" or ages, the one immediately preceding the fifth sun of the Aztec people, presided over by Quetzalcoatl. This caused Graulich to consider that the only possibly historical data in the Aztec chronicles are the names of some rulers and possibly some of the conquests ascribed to them. Furthermore, among the Nahuan peoples the word "Tolteca" was synonymous with artist, artisan or wise man, and "toltecayotl." "Toltecness" meant art, culture, civilization, and urbanism and was seen as the opposite of "Chichimecayotl" ("Chichimecness"), which symbolized the savage, nomadic state of peoples who had not yet become urbanized. This interpretation argues that any large urban center in Mesoamerica could be referred to as "Tollan" and its inhabitants as Toltecs – and that it was common practice among ruling lineages in Postclassic Mesoamerica to strengthen claims to power by claiming Toltec ancestry. Mesoamerican migration accounts often state that Tollan was ruled by Quetzalcoatl (or Kukulkan in Yucatec and Q'uq'umatz in K'iche'), a godlike mythical figure who was later sent into exile from Tollan and went on to found a new city elsewhere in Mesoamerica. Claims of Toltec ancestry and a ruling dynasty founded by Quetzalcoatl have been made by such diverse civilizations as the Aztec, the K'iche' and the Itza' Mayas. While the skeptical school of thought does not deny that cultural traits of a seemingly central Mexican origin have diffused into a larger area of Mesoamerica, it tends to ascribe this to the dominance of Teotihuacán in the Classic period and the general diffusion of cultural traits within the region. Recent scholarship, then, does not see Tula, Hidalgo as the capital of the Toltecs of the Aztec accounts. Rather, it takes "Toltec" to mean simply an inhabitant of Tula during its apogee. Separating the term "Toltec" from those of the Aztec accounts, it attempts to find archaeological clues to the ethnicity, history and social organization of the inhabitants of Tula. Brinton, Daniel Garrison (1887). "Were the Toltecs an Historic Nationality?". Proceedings of the American Philosophical Society. 24 (126): 229–241. JSTOR 983071. Charnay, Desiré (1885). "La Civilisation Tolteque". Revue d'Ethnographie. iv: 281. Diehl, Richard A. (1993). "The toltec Horizon in Mesoamerica: New perspectives on an old issue". In Don Stephen Rice (ed.). Latin American horizons: a symposium at Dumbarton Oaks, 11th and 12th October 1986. Dumbarton Oaks. Florescano, Enrique (1999). The Myth of Quetzalcoatl. Lysa Hochroth (trans. ), Raúl Velázquez (illus.) (translation of El mito de Quetzalcóatl original Spanish-language ed.). Baltimore, MD: Johns Hopkins University Press. ISBN 0-8018-7101-8. OCLC 39313429. Graulich, Michel (2002). "Los reyes de Tollan". Revista Española de Antropología Americana. 32: 87–114. Kirchhoff, Paul (1985). "El imperio tolteca y su caída.". In Jesús Monjarás-Ruiz; Rosa Brambila; Emma Pérez-Rocha (eds.). Mesoamérica y el centro de México: Una antología. Mexico City: Instituo Nacional de Antropología e Historia. pp. 249–272. ISBN 978-968-6038-26-2. Smith, Michael E. (2007). "Tula and Chichén Itzá: Are We Asking the Right Questions?". In Kowalski, Jeff Karl; Kristin-Graham, Cynthia. Washington (eds.). Twin Tollans: Chichén Itzá, Tula, and the Epiclassic to Early Postclassic Mesoamerican World. Washington DC: Dumbarton Oaks. pp. 579–617. Smith, Michael E. & Lisa M. Montiel (2001). "The Archaeological Study of Empires and Imperialism in Prehispanic Central Mexico". Journal of Anthropological Archaeology. 20 (3): 245–284. doi:10.1006/jaar.2000.0372. Smith, Michael E. & Cynthia Heath-Smith. "Waves of Influence in Postclassic Mesoamerica? A Critique of the Mixteca-Puebla Concept" (PDF). Anthropology. 4 (2): 15–50. Ringle, William M.; Tomás Gallareta Negrón; George J. Bey (1998). "The Return of Quetzalcoatl". Ancient Mesoamerica. Cambridge University Press. 9 (2): 183–232. doi:10.1017/S0956536100001954. Veytia, Mariano (2000) . Donald W. Hemingway and W. David Hemingway (compilation and eds.) (ed.). Ancient America rediscovered: including an account of America's first settlers who left from the biblical tower of Babel at the time of the confusion of tongues. Ronda Cunningham (trans.) (Translation of the first 23 chapters of Book 1 of the Veytia's Historia antigua de Mexico, 1st English ed.). Springville, UT: Bonneville Books. ISBN 1-55517-479-5. OCLC 45203586.